What’s in a rainbow? Fairytales and pixie dust? Gold and leprechauns? A boatload of drugs? Nope, just clear cold geometry and physics, just how we like it. Rainbows are a funny phenomenon. Everyone vaguely knows they have something to do with sunlight and water. But why should sunlight haphazardly reflecting from water produce such a clearly-defined ring, with the colours all nicely separated? Surely if the sunlight was bouncing off of all of the raindrops in the sky we should just be seeing some crazy fuzzy mess? To get a handle on what’s going on, let’s look at what happens when light hits a spherical drop of water. Typical raindrops are around 1 mm in size, which is thousands of times larger than the wavelength of visible light and we can be comfortable using a geometric optics approach where the light is approximated by discrete ‘rays’. Now rainbows always appear on the opposite side of the sky to the sun. The reason is that sunlight reflects from water in the air, back into your eye, as sketched below. What we need to do is work out how the light reflects back given the geometry of a spherical rain drop. 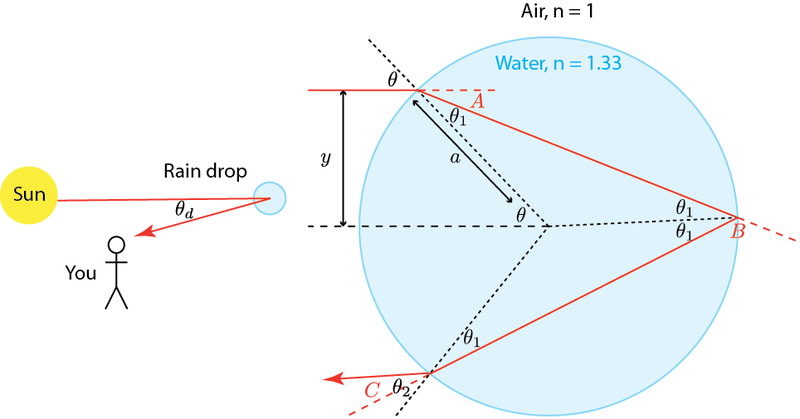 The light ray enters the drop and is deflected by a small angle due to the differing refractive index of the water drop (roughly 1.33 for visible light). The ray then bounces once inside, and is deflected by an angle . Finally the ray leaves the drop and again is deflected due to the change in refractive index, this time by an angle . 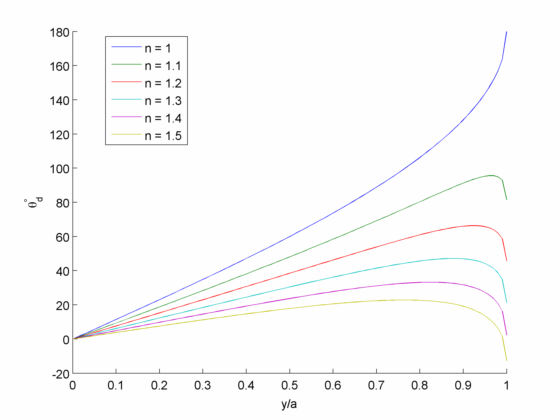 This function is plotted below, and looks like it makes sense. For the deflection is 0, the ray just bounces straight back no matter what the refractive index. For all where there is some reflection the deflection angle gets larger as you move farther up the droplet. 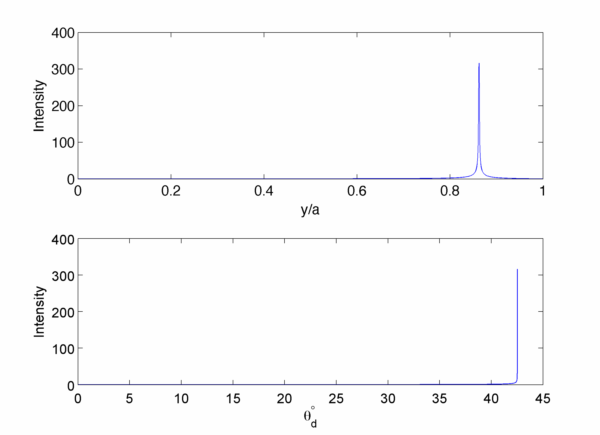 The light intensity coming out of the droplet will therefore diverge when . As plotted below for water this divergence is very sharp, and is essentially caustic focussing of the incoming rays. What this means for our rainbow is that all the light we see comes from one angle, in a very narrow band. The reason it’s a circle is due to the spherical symmetry of a rain drop. This explains why rainbows are so sharp and neatly contained, and the reflection of light doesn’t end up in a big mess on the sky. Now from a previous post I know I have the computational machinery to directly simulate electromagnetic waves, so lets see what this looks like for a water drop. For computational reasons I’ll have to scale the drop down pretty small, only 30 m, but it’s still quite a few times the light wavelength so hopefully the geometric results here will hold. Light is injected from the left, with a flat wavefront to approximate the sun’s rays. For simplicity of visualisation only the top half of the drop receives light, the bottom half would look the same but flipped. I’ll leave it as an exercise to the reader to find the critical angle for double reflections, but it does exist and is larger than the one for single reflections. This then creates a second rainbow outside the first, and the extra bounce means all of the colours are inverted. I remember having a lecture on this when I was at maths summer school with the OU! Not that I can remember much about it 20 yrs on! That’s brilliant! I love your animation. Did you use Processing language? Thanks! This was all simulated and visualised in Matlab, though I’ve been looking at processing. Would you recommend any learning resources?